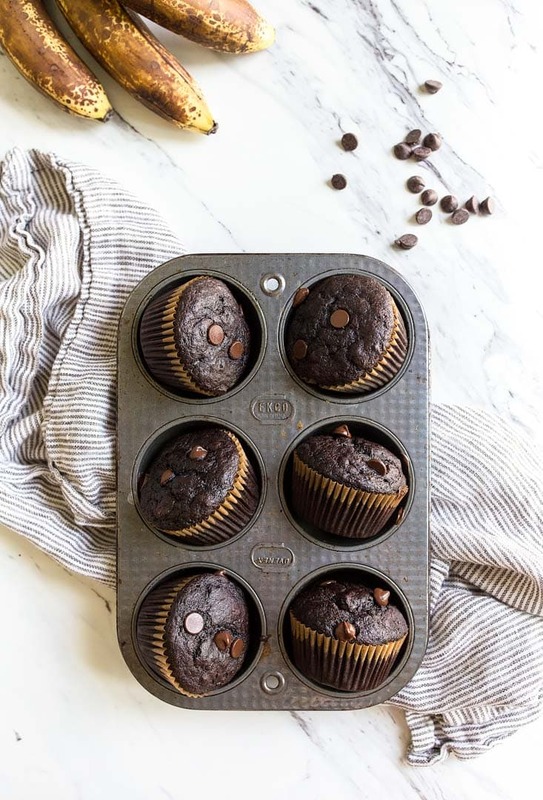 Chocolate banana muffins are a fun way to use up one lonely brown spotted banana! 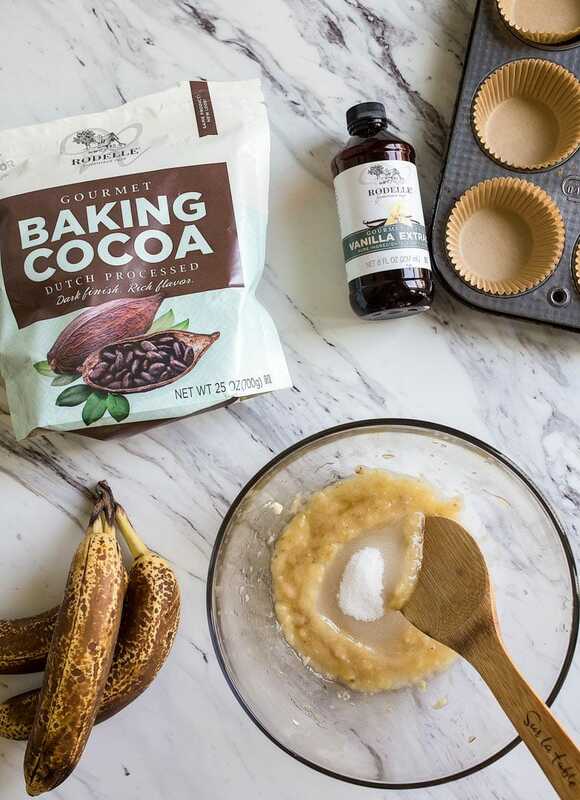 This small recipe makes 6 chocolate banana muffins. This is another recipe is sponsored by Rodelle; remember my chocolate graham crackers? I made these chocolate banana muffins for my toddler, and I had every intention of posting them in the Baby Food section on this site. But, I made the mistake of eating one. I ate it hot, right out of the oven. Oh, Mama. The warm, tender chocolatey muffin with two types of chocolate did a number on me. This recipe is based on my vegan banana muffins recipe. I received a question last week inquiring about a substitute for the flaxseed. I forgot to tell you that the flaxseed mixed with water is an egg substitute, which keeps the muffins vegan. If you want to substitute it, use a real egg! It’s not vegan then, of course, but it worked for her. So, I made these chocolate banana muffins with an egg. I cut back on the sugar a touch–just 1/4 cup for 6 muffins isn’t bad, right Mamas? I added chocolate chips and Rodelle’s Dutch-processed cocoa powder. They’re perfection. Over the past 2 weeks, I’ve made the recipe 4 times and my testers have, too. We all agree they’re the lightest, fluffiest, most tender and moist little banana muffins around. 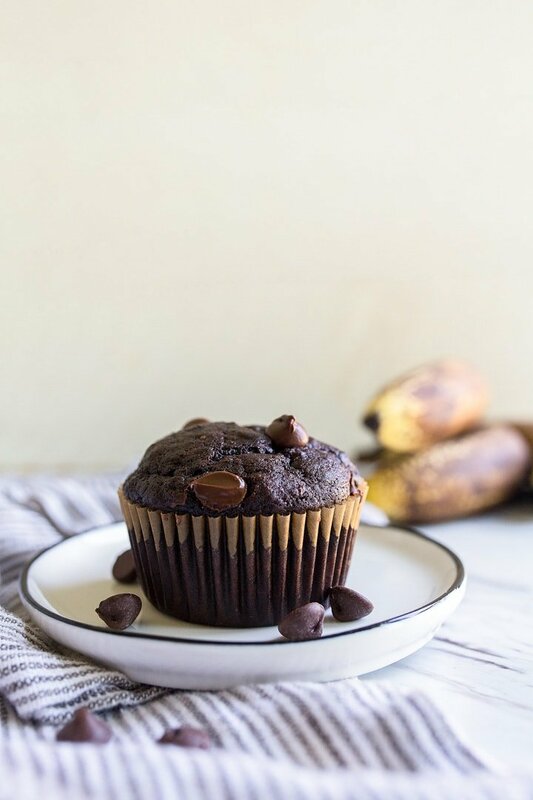 You could open a coffee shop with just these chocolate banana muffins on the menu, and I think you would succeed. I think the key is Rodelle’s Dutch cocoa. It has a dark, rich flavor that makes the muffins almost black instead of brown. More color = more flavor, especially when it comes to chocolate. 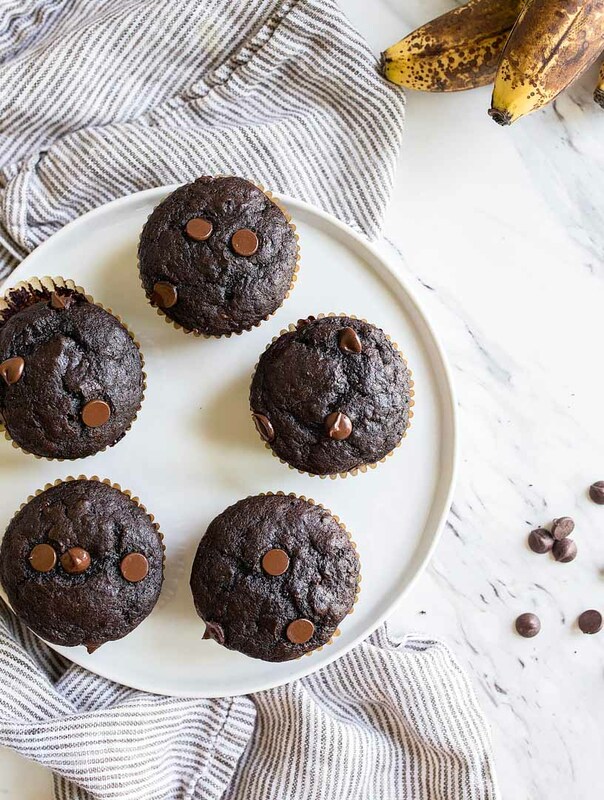 Next time you have a lonely brown banana on your counter, I hope you think of these muffins! 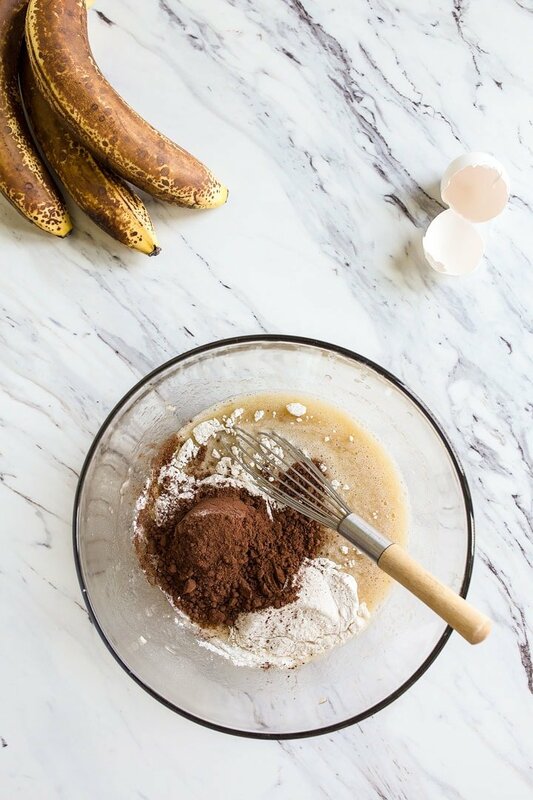 It only requires one banana and one egg to get sublime banana muffins in your face in less than 30 minutes. First, mash the banana very well with a fork before stirring in all of the liquid ingredients. When it comes time to add the dry ingredients, use a whisk to break up any lumps. The cocoa powder will be sufficiently sifted with the whisking action. You can definitely double this recipe and make 1 dozen muffins, and the muffins keep great in the freezer for up to 1 month. In that case, defrost them in the microwave in 15 second intervals until warm. Although, I don’t think you’ll have any problem with leftovers since it only makes 6 muffins. The muffins are usually gone by the end of the day in my house! Preheat the oven to 350, and line a muffin pan with 6 cups. In a large bowl, mash the banana very well with a fork until it's smooth. Mash it very well until it's almost liquid, not lumpy. Next, whisk in the sugar, oil, egg and vanilla extract. Whisk very well until combined. 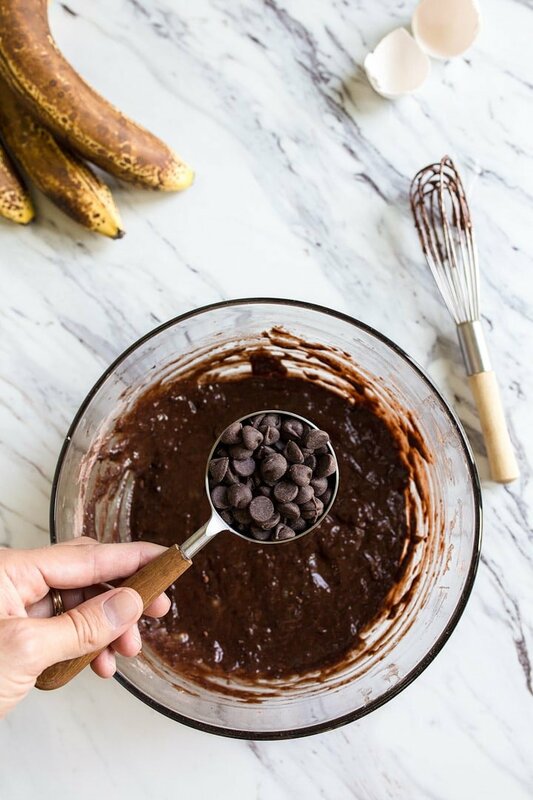 In the same bowl, sprinkle the flour, cocoa powder, baking soda, and salt on top. Using a spatula, stir until well-combined. Finally, stir in the chocolate chips, saving a few for the top of the muffins. 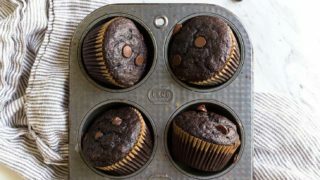 Divide the batter between the muffin cups evenly, and sprinkle chocolate chips on top of each muffin. Bake for 18 minutes, or until the muffins are done. They're done when they spring back when pressed gently on the top. Move the muffins to a cooling rack, and let cool completely before serving. I can’t find the written recipe text! I don’t want to transcribe from the video. Please always post the text for written word people like me! I am long time loyal fan, and I have all of your books. Hi, I can’t find the measurements. Am I missing something? Sorry, Neha! I just fixed it. Refresh. Sorry about this! Thank goodness you did, I thought I was losing my marbles! Am I blind? Where is the recipe? I see lots of pretty pictures, some words about how it’s based on another recipe. Am I suppose to track that one down and make notations and corrections to arrive at this one? Woah, those muffins look amazing! :O Some more one-bowl recipes are definitely a win, I’ll be trying this one out soon. Also, (Argh I don’t want to be nitpicky, but they ARE one of your sponsors :/) you spelled Rodelle as Roselle in the ingredients list. Look perfect! How much cocoa did yo add to the recipe? I’m going to make these little beauties today. I also love how you say you were making these for your toddler, but ending up loving them yourself. I think that every time I make your protein bars with the hemp hearts and mini chipits, they have become a staple in our home and we are both retired. lol. Thank you for all your fabulous recipes. Hello!!! :) Can i use unsweetend cocoa because i don’t have Dutch? Thank you so much! These are delicious and wil be a frequently returning recipe here! I love how it uses that one brown ripe banana that always seems to be present on my fruitbowl ;) very moist good muffin! These look delicious. I’m always trying to sneak in extra “healthy” calories into my children’s diet since they seem to quickly burn through them through sports. Any suggestions for these muffins? For instance, can I add 1/4 cup of peanut butter? Yes, the perfect recipe to figure out what to do with that scant overripe banana leftover by itself. Now I can make these awesome muffins which for sure be devoured quickly in my house, too. Can you substitute the canola oil with a different type of oil? I’d like to substitute plain Greek yogurt for the oil to increase the protein count. If that’s possible, how much Greek yogurt would I need to use? Thanks! In the oven now! Cannot wait to try them! 4. I used the cocoa powder I had in my hand. They came out AMAZING! So moist! Absolutely lovely. took half star off because I thought they were more like cupcakes rather than muffins, but I’m totally fine with that. I did #3 because I heard it’ll help develop the muffin tops but it actually didn’t work :/ I think it’s also because I forgot to add chocolate chips, which made the batter less amount but I think I like this way because then I can enjoy the moist texture better. I just made them today and it turned out real good! I always look forward to your recipes bec I live with 2 roommates and small batch is really all I need. Thank you. This turned out perfect. Even without the chocolate chips. Thank you! Can you substitute oil with butter? If so, how much? I tried this recipe and it was a disaster. The cocoa was too much and the sugar was too less. Since I have been baking, I realised that the flour-to-cocoa ratio was a bit off so I reduced the cocoa. Despite that it turned out bitter! Looked great, but tasted horrendous! Complete waste of my material. This is kind of insane, Nan, because many people have made these and they turned out great. I make them several times a month myself. I’m wondering what kind of cocoa powder you’re using…or how you’re measuring it? Did you watch the video on how to make them? I just wanted to say, these muffins are completely perfect in every way and I’ve made them several times now! But today I wanted just plain banana chocolate chips muffins. So I left out the cocoa powder and subbed an extra 1/4 cup of flour. It was a success! In case anyone is interested! This recipe so perfect for using up that one extra banana laying around! Any suggestions for these muffins? For instance, can I add 1/4 cup of peanut butter? I haven’t tried it, but it sounds delicious!